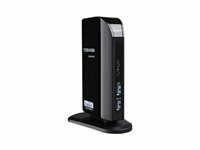 Toshiba's stylish dynadock V3.0+ universal docking station combines eye-catching looks with intelligent design to create a comprehensive workspace solution that's as compact as it is convenient. Plug in any laptop using a single cable and effortlessly connect to all your mobile and office peripherals, including your mouse, keyboard, external drives, HD TV, monitors, headphones, sound system, mobile phone and microphone. Four USB 3.0 ports offer speeds up to ten times faster than USB 2.0 and enable you to de-clutter your desk and get rid of messy cables without sacrificing functionality, or productivity. High-quality Gigabit LAN ensures quick, seamless networking, while Sleep-and-Charge technology is always on to keep your docked devices fully-powered and ready to go.The dynadock V3.0+ also supports monitors with DVI, VGA or HDMI ports and video resolution of up to 2048 x 1152 pixels. It's the ideal way to stay organized.